Chronic Obstructive Pulmonary Disease is a chronic lung condition that is usually the end result of years of smoking. The hallmark of the condition is irreversible airflow obstruction, i.e. narrowed airways. Patients typically complain of shortness of breath, chronic cough or recurrent respiratory infections. COPD encompasses several different subtypes of disease, including emphysema (destruction of air sacs of the lung) and chronic bronchitis (inflammation of the airways). 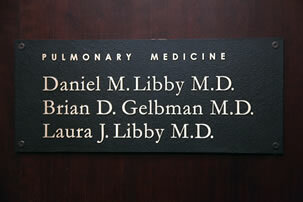 Our doctors are well versed in diagnosing and managing COPD. There is now a plethora of medications available to treat COPD, as well as non-pharmacologic therapies such as pulmonary rehabilitation, oxygen therapy, nebulized therapy, and other assisted breathing devices. We partner with several third parties to provide comprehensive COPD care. Since most COPD patients are former smokers, we commonly recommend annual CT screening against lung cancer. In addition, Our patients are taught the proper technique for use of their inhalers, counselled on signs and symptoms fo COPD flares and empowered to treat them according to pre-determined plans. Our office performs the necessary diagnostic tests such as oxygen saturation monitoring, pulmonary function testing, and cardiopulmonary exercise testing.